« 35th National Pesticide Forum Begins Today at University of Minnesota! (Beyond Pesticides, May 1, 2017) The Florida Keys Mosquito Control District released 20,000 male mosquitoes infected with Wolbachia bacteria near Key West, as a trial strategy to manage mosquitoes that carry Zika and other viruses. The district and others have been exploring new ways to suppress infected Aedes aegypti mosquito populations, which thrive in urban environments and can spread Zika, dengue fever, and chikungunya. It is unclear what impacts, if any, these infected mosquitoes will have on non-target organisms or public health. 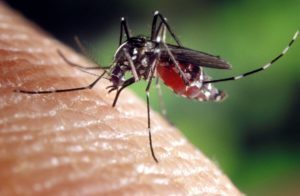 The trial is the second U.S. test conducted with the naturally occurring Wolbachia bacteria in Aedes aegypti mosquitoes, developed by the Kentucky-based company MosquitoMate. The first test occurred in Clovis, California, last year. In September 2016, the U.S. Environmental Protection Agency (EPA), which registers mosquito control products, approved and expanded an experimental use permit (EUP) for Wolbachia pipientis-infected Aedes aegypti mosquitoes (not to be confused with genetically engineered (GE) mosquitoes). According to the agency, Wolbachia are naturally occurring bacteria commonly found in most insect species, but not in the Aedes aegypti. This strain of Wolbachia is extracted from Aedes albopictus embryos and microinjected into Aedes aegypti embryos. Male Aedes aegypti mosquitoes are shipped to testing sites where they are released and mate with wild-type Aedes aegypti females that do not carry Wolbachia. After mating, the bacteria prevents the new embryos from developing properly so the mosquitoes cannot successfully reproduce. In preliminary assessments, EPA concluded that the experimental work initially approved for the EUP in 2015 presented minimal risks to non-target organisms and the environment. However, releasing these mosquitoes into the environment will provide real-world information of the efficacy of this treatment, and may identify unintended environmental consequences or human-related impacts (although this will require long-term study). The infected mosquitoes were flown in cardboard tubes, similar to ones used in paper towel rolls, from Lexington, Kentucky to Key West. The mosquitoes were released at the Stock Island test site, about 25 acres with residential and commercial properties just north of Key West. The trial is expected to last about three months, with twice-weekly releases. Genetically engineered (GE) mosquitoes have also been approved for testing in the fight against the Zika virus. Keys officials are still considering a separate test of mosquitoes genetically engineered by the British biotech firm, Oxitec, to produce Aedes aegypti offspring that die outside a lab. In February 2016, Oxitec submitted a draft environmental assessment to the U.S. Food and Drug Administration (FDA) and a month later FDA published a preliminary finding of no significant impact in support of the field trial. FDA initially approved a trial in a residential neighborhood near Key West, saying the test would not significantly affect the environment, but outrage from concerned residents forced the district to find a new location. Last November, residents of the Florida Keys approved the experiment use of GE mosquitoes. Open field trials of GE mosquitoes have been conducted in certain places like Brazil, the Cayman Islands, Panama, and Malaysia. Experiments with Oxitec’s GE mosquitoes call for large numbers of modified males to be released in the wild to mate with female mosquitoes and produce offspring that are unable to develop. To create these autocidal male mosquitoes, the company uses the antibiotic tetracycline to act as a chemical switch, allowing the GE larvae to develop and survive in the lab, rather than die immediately as planned in the wild. Larvae are supposed to die in the wild due to an absence of tetracycline. Currently, genetically engineered mosquitoes, like those produced by Oxitec, are regulated by the FDA, while modifying mosquitoes through other techniques, such as MosquitoMate’s bacteria, fall under the EPA’s juridiction as pesticides. FDA is seeking public comment on a proposal clarifying which mosquito-related products it regulates and which ones would be regulated by EPA. See information about FDA regulation of the Oxitec mosquito and public comment here. According to the FDA proposal, EPA would regulate any mosquito-related products controlling mosquito populations, while the FDA would regulate products making other claims, such as preventing disease. Mosquito populations are typically treated using an arsenal of adulticides that include organophosphates like naled and malathion, and pyrethroids like permethrin and sumithrin. These pesticides have been linked to a host of adverse effects, including neurotoxicity, cancer, and reproductive dysfunction. Further, adulticiding has been shown to be the least effective method for reducing mosquito populations for a variety of reasons, and results in pesticide drift affecting human health and non-target organisms like honey bees. For more on pesticides related diseases, visit the Pesticide Induced Disease Database (PIDD). Control of disease-carrying mosquitoes can be successful when emphasis is placed on public education and preventive strategies. Individuals can take action by eliminating standing water, introducing mosquito-eating fish, encouraging predators such as bats, birds, dragonflies and frogs, and using least-toxic larvacides like bacillus thuringiensis israelensis (Bti). Community-based programs should encourage residents to employ these effective techniques, focus on eliminating breeding sites on public lands, and promote monitoring and action levels in order to determine what, where, and when control measures might be needed. Through education of proper cultural controls, and least-toxic and cost effective biological alternatives, the use of risky technologies such as toxic pesticides and GE mosquitoes can be avoided. For additional information and resources on least-toxic mosquito control alternatives, see Beyond Pesticides’ Mosquito Management program page. This entry was posted on Monday, May 1st, 2017 at 12:00 am	and is filed under Alternatives/Organics, Biological Control, Florida, Genetic Engineering, Mosquitoes. You can follow any responses to this entry through the RSS 2.0 feed. You can skip to the end and leave a response. Pinging is currently not allowed.